New York City, NY – The two-day "Business & Investment in Qatar Forum," held in New York City, wrapped up today amid very positive reviews by U.S. business leaders and policymakers. The high-level event, the first Qatari "road show" of its kind in the United States, drew over 1,500 participants. 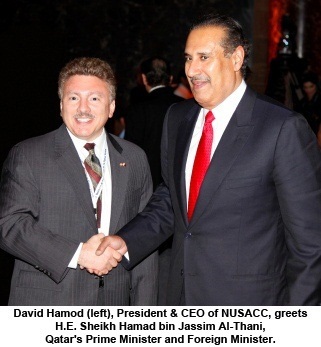 The National U.S.-Arab Chamber of Commerce (NUSACC) served as the lead U.S. business partner for the Forum. "Qatar has an impressive story to tell, and U.S. companies are keen to listen," noted David Hamod, President and CEO of the U.S.-Arab Chamber. "With more than $100 billion in new projects in the pipeline, and with the World Cup on the horizon for 2022, Qatar has certainly captured the attention of the American business community." 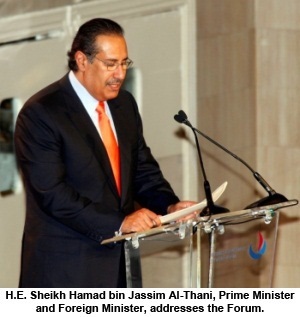 The Qatari delegation was led by H.E. Sheikh Hamad bin Jassim bin Jabr Al-Thani, Qatar’s Prime Minister and Foreign Minister, said the Forum served to "raise the degree of knowledge and awareness for American investors" interested in Qatar. "Economic expectations for the coming years are optimistic and supported by an ambitious spending plan nearing $170 billion to be assigned to existing projects and projects planned for the coming ten years," stated H.E. the Prime Minister. "After achieving a 16.3 percent growth rate in 2010, one of the highest internationally, the Qatari economy is expected to achieve a 20 percent increase, with stable prices, in 2011, according to the International Monetary Fund." 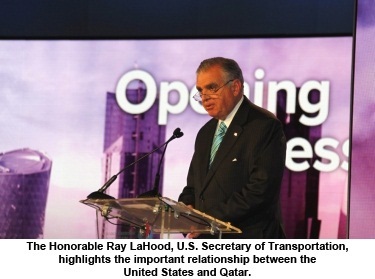 The Honorable Ray LaHood, U.S. Secretary of Transportation, led the U.S. Government delegation. "The facts and figures tell the story," he noted. "Between 2004 and 2010, American exports to Qatar surged by 600 percent. Between 2005 and 2010, trade between our two nations more than doubled. Today, the United States is Qatar’s single largest foreign investor, with more than 120 companies on the ground." The U.S. Secretary of Transportation said that Qatar has recently invited the U.S. Government to provide expert advice on that Gulf nation’s highway system, which is expanding rapidly to serve the emirate’s development needs. The State of Qatar, he concluded, has "not only emerged as a regional power, but also as a remarkable partner." 1) Qatar Airways signed an agreement with The Boeing Company for the purchase of five 777 freighters, valued at $1.4 billion. The total value of Qatar Airways firm and option 777s and 787s exceeds $20 billion. 2) The First Investor, a subsidiary of Barwa Bank, and The Hines - Archstone Group signed a deal for the construction of CityCenter DC, a 10 acre site for mixed use real estate development in Washington, DC. This is a $700 million project, with six buildings planned for the site. 3) Qatar Rail awarded the construction management contract to AECOM / Parsons for the new Lusail Light Rail Transit (LRT) system. This project is key to the transportation infrastructure of Lusail City, one of the largest and most ambitious real estate development projects being undertaken in the Middle East. The Lusail LRT is part of the Qatar Railway project, a $30 billion integrated railway system. ​4) Qatar's Public Works Authority awarded Parsons International the design contracts for two new highways on the East-West Corridor, as well as the Wakrah ByPass. The East-West Corridor is a new 20 km, 8-10 lane highway that will accommodate Qatar Rail and will provide fast and direct access to the New Doha International Airport. The total construction value of the two projects is more than one billion dollars. Coinciding with the Forum, the National U.S.-Arab Chamber of Commerce launched a special issue of its quarterly journal, U.S.-Arab Tradeline, focused exclusively on the State of Qatar. Much of the discussion at the Forum revolved around Qatar’s National Vision 2030 development plan and the 2022 World Cup. Sectors highlighted at the Forum included infrastructure, energy, industry, banking & finance, media, information and communications technologies (ICT), real estate, healthcare, education & the knowledge-based society, culture, tourism, and sports. ​According to a recent report issued by the National U.S.-Arab Chamber of Commerce, U.S. exports to Qatar are expected to grow to $5.59 billion by the year 2013. The U.S. share of merchandise imported to Qatar is expected to grow to almost 18 percent by 2013, and its share of services imported to Qatar is expected to be almost 24 percent. Hamod concluded, "In addition to bringing in some of the best minds and some of the best talent that the world has to offer so that Qataris can tap into that knowledge, it also works the other way: Americans studying and working in Doha gain a window into Arab society and Qatari society in particular."